This incredible tour is unlike any other you can find on Oahu. Spend the day exploring the unique geography of Hawaii’s “Big Island”. 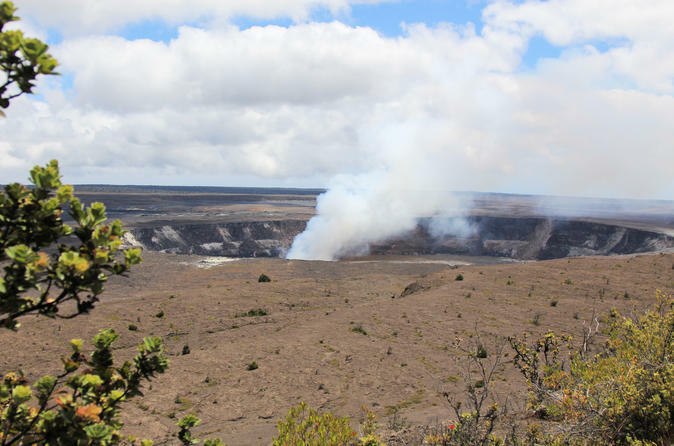 On a visit to Hawaii Volcanoes National Park you’ll learn about the seismic activity that’s been a constant on the Big Island and the culture that sprang up around it. This incredible tour is unlike any other you can find on Oahu. Spend the day exploring the unique geography of Hawaii’s “Big Island”. On a visit to Hawaii Volcanoes National Park you’ll learn about the seismic activity that’s been a constant on the Big Island and the culture that sprang up around it. You’ll see Mauna Loa, the world’s largest volcano, and Kilauea, the world’s most active volcano. You’ll also see other dormant volcanoes and ancient lava beds while discovering the legends meant to explain these natural phenomena. While there is no guarantee of a red-hot lava flow sighting, you can see the smoldering crater and intriguing steam vents showcasing Kilauea’s activity. By the tour’s end you’ll know exactly how and why volcanoes occur. You’ll also take in some of the most unique scenery Hawaii has to offer along the way.